IBPS Clerk 2018 Apply Online – IBPS Clerk notification has released. The IBPS Clerk online application 2018 begins from 18th Sep 2018. The candidate who plans to take up IBPS Clerk 2018 exam can submit your application before 10th Oct 2018. IBPS Clerk 2018 Apply Online link has integrated with the Payment gateway. The applicant can be paid their application fee through IBPS Clerk online application 2018. Applicant must ensure their eligibility norms before to apply for IBPS Clerk 2018. Dear Aspirants before getting into the application process, you must know the required document list to fill up IBPS Clerk online application 2018. There are some specifications are available to upload the documents for IBPS Clerk 2018 apply online application. Details are mentioned below. Most of the existing user is know the application procedure of IBPS Clerk 2018 apply online. If you are a new user read and understand the below guideline to apply online. Online IBPS Clerk application is the important step of a recruitment process. Pay attention while filling up the online application form for IBPS Clerk 2018. Provide genuine details and fill up the IBPS Clerk online application 2018 without error. Hence check twice to submit the application form. Visit the official website of IBPS – www.ibps.in or Click the Direct link for IBPS Clerk 2018 Apply online. The link will re-directed to the registration page. The Registration Number and the password will be sent to the registered mobile number and email id. And a Hand Written Declaration as follows, the handwritten declaration must in English and should written only by the appropriate candidature. The applicants can not do any modification after “Final Submission”. 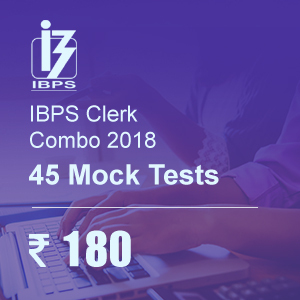 The candidates can verify the details before to submit IBPS Clerk 2018 application form. The application form integrated with the payment gateway and payment process. On successful completion of the transaction, the candidate will get e-receipt for the payment.